Dynasty Rogues writer Nick Whalen, a former QB/WR/DB coach and assistant student coach at four colleges, gets props for going against the grain and invoking the awesome Marty Schottenheimer as a big influence for his offense. Photo by Smart Goofy Dog. Nick Whalen unveiled a team that wants to beat you up on both side of the ball. I love it. As with all the teams we’ve see thus far, there are discernible holes that could derailthis freight train offense and big, bad defense. However, I love the approach Whalen takes – giving the middle finger to the trendy approach of spread offenses. Ben Muth did this, too. One might argue that Whalen might take it a bit more to an extreme. As with the rest of the writers thus far, I enjoy Whalen’s honesty about the vulnerabilities of his team. Yet, there are some areas where I also detect confidence that his risks will pay off. Great stuff. “Marty Ball 2012″ here we come. Running the football is ancient thinking and won’t work in the present NFL with all of the rule changes? Wrong. I have two main reasons why I chose a run-centered attack for my offensive philosophy. First, in today’s NFL offenses have evolved into high-flying passing attacks, which defenses have countered by incorporating smaller, quicker defenders that can pressure the quarterback. This has allowed for rush defenses to suffer the past few seasons in the NFL. As you can see in no other three year period have rush defenses been worse than in the present NFL. Defenses with a base 3-4 scheme averaged 4.11 yards per carry to opposing offenses last season. Finally, a run-focused offense is much cheaper to build versus a passing-focused offense. Left tackles that are super athletic or quarterbacks with laser rocket arms are at a premium in the NFL and therefore they’re expensive to acquire in this project. The majority of sets that this offense will use are 21 and 20 personnel. 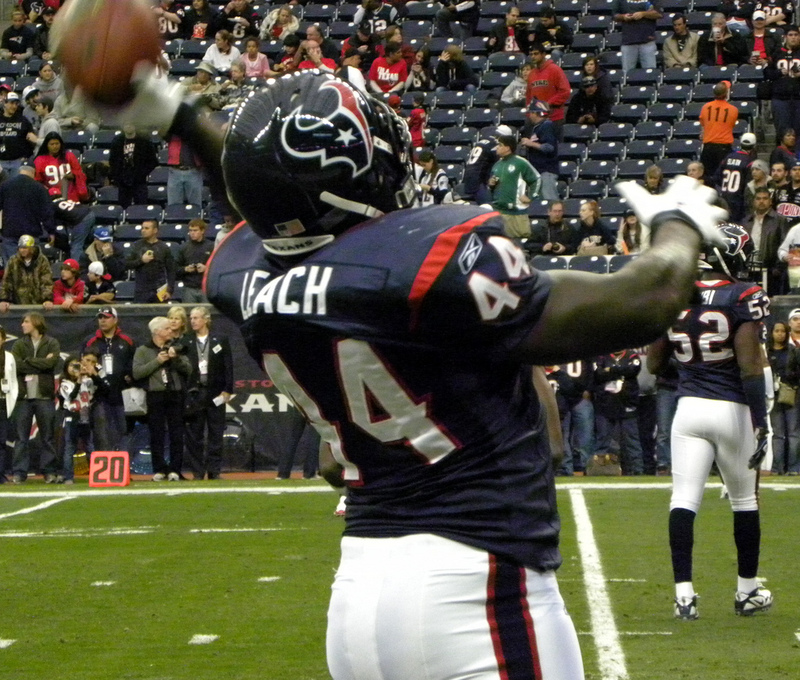 I will be using Vonta Leach, the best run-blocking fullback in the NFL, at a premium. Tight end Martellus Bennett’s 6’6″, 296-lbs. frame and run-blocking ability will be a great asset in the scheme. From time to time we’ll also use 22 personnel to tap into the great potential of fellow tight end Kyle Rudolph and wide receiver Mike Wallace on the outside to keep defenses honest. For long-yardage situations or when trailing by two scores, 10 personnel will be in the playbook. We’ll also use this personnel set for change of pace and two-minute situations. Emmanuel Sanders and Golden Tate will play the slots in 10 personnel. They were brought to this team because both are very good run blockers and can develop into good receiving threats. However, we will be losing lots of games if we’re in 10 personnel often. The last personnel package will involve my backup quarterbacks Terrelle Pryor and Darron Thomas. They will have a few zone read concepts that will take advantage of their skill as runners. Short yardage, red zone and change of pace will be the situations they will come in to use these concepts. Only three of my nine offensive lineman are below 310 lbs. and all of them were acquired for their run-blocking ability. A straight-ahead, power, man-on-man run-blocking scheme is the calling card for this unit. Watching Brandon Albert, John Sullivan, Harvey Dahl combo block up to the second level, pulling, and double-team to get movement and combine that with Vonta Leach leading through the hole should be a thing of beauty. The most confusing part of this offense to me is knowing which of Jonathan Stewart and Peyton Hillis is supposed to be Kevin Mack. Where’s Earnest Byner? You’re killing me, Nick. And those runners could kill run-soft, NFL defenses. Photo by Erick Daniel Drost. Jonathan Stewart (5’10″, 235 lbs.) 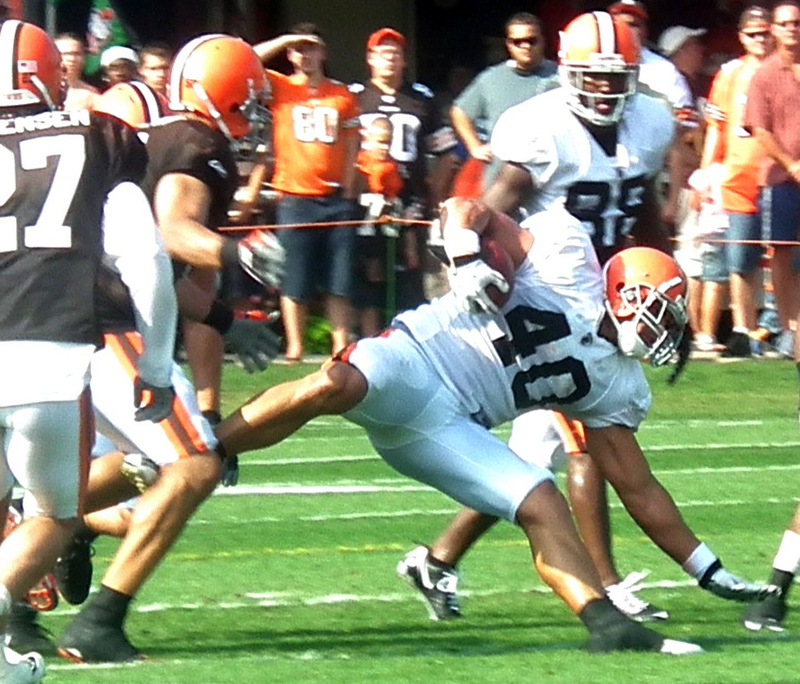 and Peyton Hillis (6’2″, 250 lbs.) should help with this power scheme and wear out opposing defenses while keeping each other fresh throughout the season. As I mentioned earlier, a few zone read run-based concepts to utilize our dual-threat quarterbacks will also be in place. Our play-action pass blocking scheme will have false pulling guards to draw the linebackers to the line of scrimmage to create voids in the secondary. This is something Luck has experience running from his years at Stanford. Our runners are also good enough to help out in pass protection by scanning to pick up blitzing linebackers and we can keep our tight ends at the line when necessary to help in pass protection. Power, Inside Zone, Iso, Counter, and Trap are going to be our main running plays from a variety of formations with the dual-threat quarterbacks rotating into the lineup during certain situations. Play-action passes complementing our ground game will exploit our speed through the use of deep crossing routes. This will force defensive backs to run with Mike Wallace and Emmanuel Sanders. Andrew Luck is very good at play action passes and decision making and should fit very well into the scheme. We will also have route combinations that attack different coverage’s on both sides of the field. For example, we can run a “Smash” concept (hitch and corner route) on the right side of the field to beat a Cover 2 defense, while also running an “Alaska” concept (two verticals) on the left side of the field to beat a Cover 1 or Cover 3. This will help Andrew Luck’s progression into becoming a strong NFL quarterback. Mike Wallace is important in this scheme with preventing defenses from stacking the line of scrimmage for the run. However, I think that Jon Baldwin is very important as well. Wallace will likely be double teamed often, which will lead to single coverage that Baldwin at 6’4″, and 228 lbs. with a 42-inch vertical has to win in the red zone. He’ll also be used in all over the field. If he can develop and win those match ups it may force the defense to keep only seven defenders in the box, which will greatly help our rushing numbers. Brandon Albert is being moved from left tackle to left guard because he has elite ability at the guard position. It’s imperative that Albert has a smooth transition because his teammate at left tackle will be JaMarcus Webb, who has struggled early on in his career. Albert can provide great experience and help to the young Webb. Marty Schottenheimer will be our offensive coordinator and implement his “Marty Ball” style to the 2012 NFL game. Run, run, and more running will be the name of the game. With the rush defensive statistics I posted earlier, combined with a very good rushing offense, it’s realistic to see many situations like 3rd and 3 or better. Creating realistic 3rd down conversions, eliminating negative plays (sacks, fumbles, and interceptions), and controlling the clock against these passing centered teams, and taking pressure off rookie QB Andrew Luck will be a winning game plan. 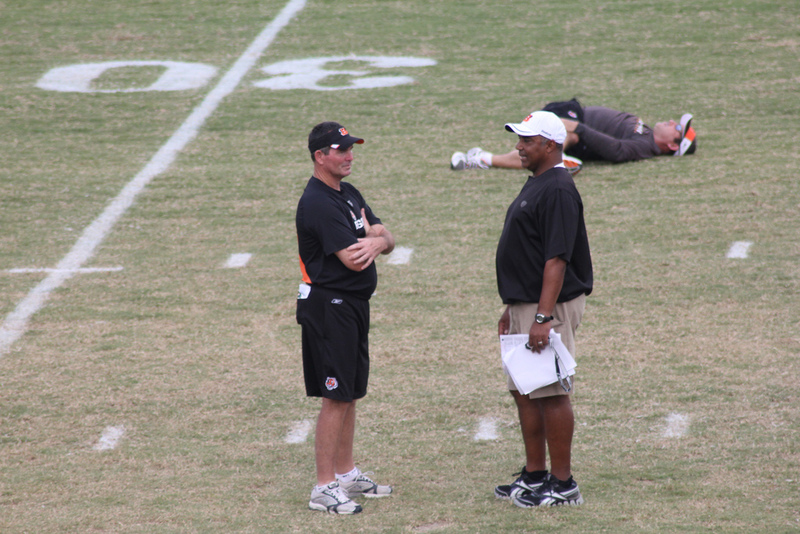 Nick Whalen might be skeptical he has what it takes to lure Marvin Lewis from his head coach spot in Cincinnati to be the defensive coordinator on his squad, but I bet if I were armed with two ribs and a smoked sausage from Saucy Q that I could get Lewis to seriously entertain the offer. Photo by Navin Ragagopalan. The 2000 Baltimore Ravens and 2001 Chicago Bears get credit for a large chunk (pun intended) of my defensive scheme. Both defenses featured a pair of huge defensive tackles that clogged up space and blockers to allow a great linebacker to make plays all over the field. The Ravens had Tony Siragusa and Sam Adams with Ray Lewis behind them. The Bears had Ted Washington and Keith Traylor with Brian Urlacher behind them. My defense will feature two 350-lb. defensive tackles – Cam Thomas and Paul Soliai – and incorporate linebacker Patrick Willis behind them. The focus of the defense is to force the offense into abandoning the run and creating minimal gains on those runs. The 4-3 will be our main defensive front. Methinks you’re going to be reading a lot about slot cornerback Brice McCain (No.41) in the coming weeks of the RSP Writers Project. I know I’ll be writing about him. Photo by The Brit_2. Our nickel package will sub slot corner Brice McCain for weak side linebacker Geno Hayes One of the best slot corners in the NFL, McCain will fortify our pass defense in these packages. In our dime package Dime, linebacker Erin Henderson will come off the field for one of Kareem Jackson, Ras-I-Dowling, or DeMarcus Van Dyke, depending upon the opponents’ personnel. Our Bear package, will replace Geno Hayes for defensive tackle Terrance Cody. Goal line defense will also feature Cody, Cam Thomas, and Paul Soliai and pair them with Corey Liuget and Stephen Paea along the defensive line. Within each of these schemes will be substitutions based upon the likelihood of a run or pass. If it’s a pass, then both Cam Thomas and Paul Soliai will be replaced with Stephen Paea and Corey Liuget, who are better pass rushers. 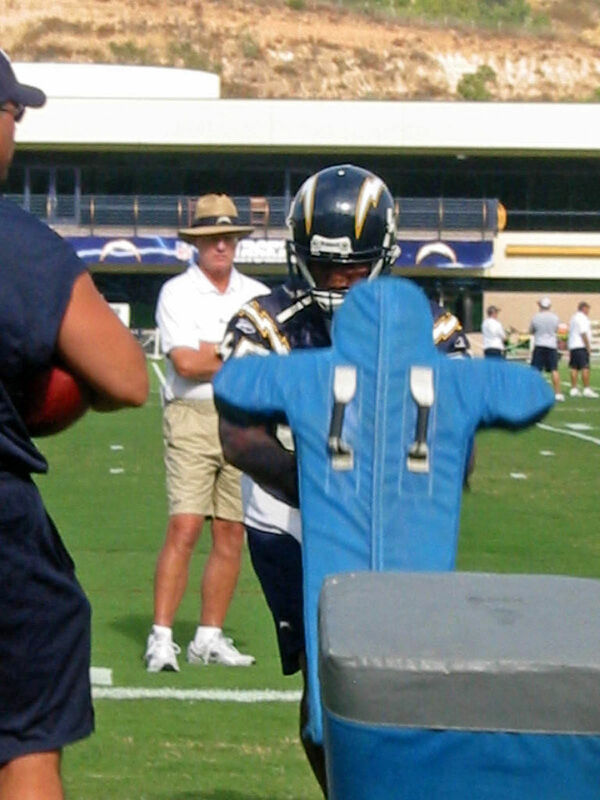 If it’s a run, then Bruce Irvin will be replaced by Corey Liuget. The defensive scheme will have Cam Thomas and Paul Soliai playing twoi or two techniques and double-gap both A and B gaps. They’re used to playing two gaps in their defensive schemes and this scheme should occupy at least the thee interior offensive linemen due to the sheer size of these defenders. We’re talking about having 700 pounds of beef for these blockers to attempt to move. Jeremy Mincey will play a Wide Nine technique as my left defensive end and Bruce Irvin will play a Wide Nine technique as my right end with Shea McClellin rotating into the lineup to keep each player fresh. By aligning wide, the defensive ends can use their athletic ability to rush the passer and occupy C or D gaps depending on the offensive formation. Getting pressure on quarterback is at a premium in the pass-happy NFL. and allowing my speed rusher to align wide and go after the quarterback is a very important part of this scheme. How are you going to deal with traps, counters, and draws – especially versus spread looks with quick backs that could take advantage of your wide nine technique with your DEs? Paul Soliai is one of the strongest players in the entire NFL and does a very good job occupying blockers. Cam Thomas is more athletic, but better at plugging up holes in the run game and shedding blockers. Their job is to line up in a 2i(inside shade of the guard) or 2(head up with the guard) techniques and occupy blockers. They will not be asked to shoot gaps in this scheme. Therefore, guards will have a more difficult time pulling away from these defensive tackles versus traditional one and three technique schemes because Thomas and Soliai will engage them right after the snap. In coaching, it’s always best to look at the worst-case scenario when preparing for an opponent. In your proposed spread look, lets assume it is personnel with four receivers with a single runner. In this worst-case scenario, lets say both Eric Berry and Earl Thomas are playing deep in a Cover 2 with corners matched up man to man with the receivers. This only leaves the four defensive linemen and Patrick Willis to stop the run. Mincey and Irvin will be in Wide Nine techniques taking away the C-Gaps. Thomas and Soliai will be in 2 or 2i techniques two-gapping. If they pull a guard, then Soliai will engage and step down to cover the backside A gap with the center blocking him. Cam Thomas will be two-gapping the front side guard and Patrick Willis will engage the pulling guard, plus clean up any trash. This might be the worst case scenario, but Soliai and Thomas shouldn’t give any ground one on one in the run game. Therefore, Patrick Willis should be able to clean up lots of run plays inside with relatively little blockers getting to the second level. Erin Henderson will play strong side linebacker spot and along with Geno Hayes at the weak side, they will align just inside the defensive end. Patrick Willis should be able to use his tremendous athletic ability to read and react to the ball. My linebackers will be blitzing often to exploit the match up problems on the interior of defensive line and with the comfort of relying on the athletic ability of my safeties. The secondary is led by two of the best young safeties in the NFL – Earl Thomas and Eric Berry. With all of the beef on the interior of my defense it will force offenses to attempt to run outside, which will feed into the strength of my defense – pursuit. My defensive ends all have high motors and Willis and the linebackers should be able to flow with minimal second-level blocking coming their way. Thomas/Berry can use their speed to get to the alley as well. The athletic ability of Thomas and Berry will allow the defense to play Cover 2 man, Tampa 2, Cover 3, Cover 1 Robber, Cover 4, Cover 9, Cover 8, and lots of rotational coverage’s stemming from the Cover 2 shell. All of that talent in the back end of my defense allowed me to save money at the cornerback position because they can cover so much area. Adam “Pac Man” Jones and Roderick Hood will start initially as my press corners playing lots of man to man. They can afford to be aggressive knowing that my two safeties are behind them. Jones and Hood bring lots of experience to the position and will be able to “coach up” the young corners Van Dyke, Jackson, and Ras-I Dowling. Dowling may be the only corner able to play match-up with the big wide receivers due to his size. Talk to me about all the cover variations of your defense that you laid out that stem from the cover 2. Can you give a quick tutorial on some of these variations and why they are important for you to mention as a part of your scheme? The reason I picked both Earl Thomas and Eric Berry is because of the potential coverages that they can give the defense. Both of these safeties are good students of the game and extremely athletic. They know where to be and can cover lots of area in the secondary. Having them teamed together can really help disguise coverages to confuse Quarterbacks, which is the name of the game in the current NFL. The width and depth of safeties really gives away coverages. Safeties at a depth of 12 yards and a yard or two outside of the hash gives away a Tampa 2 coverage. Safeties at a depth of 12 yards and a yard outside of the hash gives away Cover 2. Safeties on the hash at 10 yards gives away Cover 4. A single safety at 15 yards in the middle of the field gives away Cover 1 or Cover 3. Now the reason I wanted both Thomas and Berry is because they’re much more athletic than most NFL safeties. They can sit in a Cover 2 shell at the snap of the football, on the hash at 10 yards and then move to whichever coverage is called. Cover 1– Thomas rotates to the deep middle of the field and Berry rotates down into the box to cover a tight end or slot receiver while that defender blitzes. Cover 1 Robber– Thomas rotates to the deep middle of the field and Berry rotates down into the box to essentially read the quarterbacks eyes. Cover 2 Sky– Thomas takes away a deep half, Berry rotates down into a flat, and a corner rotates to occupy the other deep half. Cover 3 Strong– Berry rotates to deep third of the field, Thomas middle third, boundary corner the deep third, and the field corner takes the flat. Cover 3 Weak– Opposite rotation of Cover 3 strong, just into the boundary. Cover 3 Strong Invert– Berry rotates down into hook/curl zone on field side, Thomas back to middle third, both corners take outside thirds. Cover 3 Weak Invert– Opposite rotation of Cover 3 Strong Invert, just into the boundary. Cover 4– This was mentioned above, but the safeties play closer to the line of scrimmage and use their athletic ability more. Cover 8– Field side safety and corner play quarter coverage and the boundary-side corner and safety play Cover 2 zone. Cover 9– Both corners are aligned with cushion and inside of WR’s and take deep half coverage, while the safeties rotate down into the box and flat in a number of variations. These are all very important to my scheme because changing up coverages confusing opposing offenses. This takes pressure off of my sub-par corners and allows my Wide Nine technique defensive ends more time to get to the quarterback. Having two very athletic safeties doesn’t time our hand in coverage for pre-snap reads. As I was alluding with Berry and Thomas, the most pivotal players in the scheme are up the middle. Football has to be played from the inside out and my defense is no exception. If my defensive tackles Cam Thomas and Paul Soliai fail to occupy blockers inside, my scheme won’t succeed. If Patrick Willis and the other linebackers can’t read multiple gaps and flow, my scheme won’t succeed. If Earl Thomas and Eric Berry aren’t dominant and can’t make up for the lack of quality at cornerback, my coverage schemes will also fail. I would love to drag Marvin Lewis into my organization as my defensive coordinator, seeing as he ran a similar scheme for the 2000 Baltimore Ravens. I expect it to be a hard sell because he’s currently a head coach, so instead I will turn to Matt Patricia. Under Bill Belichick, Patricia has been a very good at being on the cutting edge of coaching with schemes and preparing for opponents. He recently started implementing having both one-gap and two-gap players on the same defensive line. Seeing that my defensive scheme uses the same concepts, I would benefit from having Bellichick’s protégé commanding the defense and preparing for opponents. Nice to hear from someone that Luck isn’t Superman…yet. Lack of experience at the quarterback position is potentially a huge flaw in my offensive scheme. Andrew Luck may be the most NFL ready quarterback to enter the NFL in years, but he still has a learning curve. His backups have little experience as well. However, being a run-based scheme, the dependence on the quarterback is minimized to an extent, as is the pressure on the quarterback to produce big numbers in the passing game. The other large flaw in my offense is at left tackle. J’Marcus Webb is 23 and has a lot of ability, but he’s allowed a lot of sacks the last two seasons. If he fails to develop his technique then left tackle will be a problem. Being in a run-first scheme really helps take pressure off the importance of the left tackle position in an offense. I also have two good blocking tight ends that I can pair with Webb to help double team or chip rushers off the edge. If that doesn’t work and Webb is hurting the offensive production, then I will lean on three veterans that all have experience at the position: Brandon Albert, Michael Oher, and Jason Smith. Each of them can move to the left tackle spot and start, while shuffling the rest of the line. According to Nick Whalen, cornerback Ras-I Dowling has the physical skills to become quality starting corner against big-time receivers, but potential and reality are a gap that Whalen has concerns about. Photo by Beth Hart. Lack of quality at corner could potentially handcuff all of the blitzing and coverage schemes of the entire defense. They need to be able to lock onto a wide receiver for at least three to four seconds for this scheme to work properly. They also have to be good at jumping the short to intermediate routes. If they consistently get picked on, it could potentially really detract from the success of this entire team. The quality of play at the safety position should really help the corners. So should the athletic ability at defensive end to pressure the quarterback and minimize the time that passers have in the pocket. I also invested into young corners with high ceilings in Ras-I Dowling, Kareem Jackson, and DeMarcus Van Dyke. Each of those corners could develop into very good players in the NFL and possibly replace a struggling Jones or Hood. I’m also worried about the quality of player at outside linebacker. Erin Henderson is average and Geno Hayes has lots of experience at the WILL, but neither is a big time player. Koa Misi has some potential to develop as does Martez Wilson, but that remains to be seen. If the outside linebackers can’t make plays when offenses attempt to run off tackle, the run defense could really suffer because the DE’s aren’t built to be huge run stuffers. Patrick Willis was needed because I needed an athletic, play making stud at middle linebacker that lead the type of defense that I want. He brings a physicality and attitude to the entire defense. The simple choice was I could have two elite safeties in Earl Thomas and Eric Berry, or one elite cornerback and from a schematic standpoint, two elite players is better than one. Mike Wallace was needed to keep a safety or two deep to avoid stacking the box and messing up my whole run based scheme. Andrew Luck is the leader of my offense and could be the next Peyton Manning, easy choice to lead my team for the next decade. Jonathan Stewart has the talent to become a star runner for as long as he stays healthy. This may seem a bit odd, but Andrew Luck will only be a role player in my run-oriented scheme. However, in time he could develop into a true star and our offense could expand into a dynamic passing attack. This current scheme will let Luck learn slowly, just like Matt Ryan did as he has sharpened his game. Chilo Rachal is a backup guard now, but I really like his chances of developing into a dominate starter in the future. He already has good starting experience and his size is a great fit within the scheme. 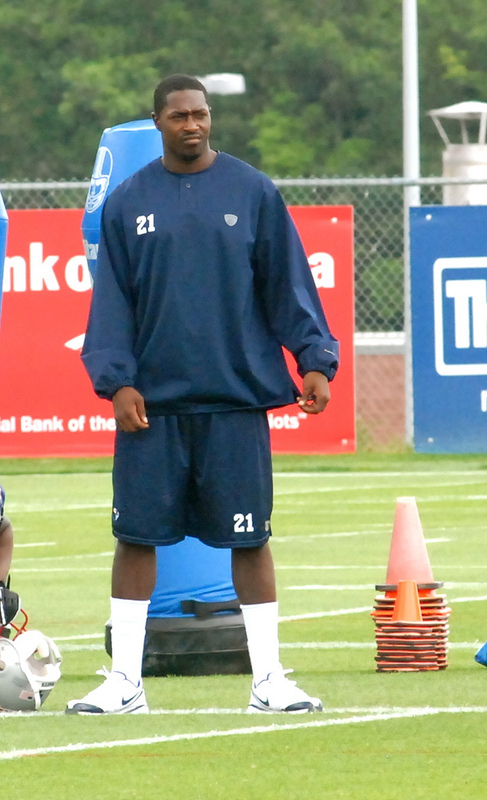 Ras-I Dowling has great size, 6’1″ and 200 lbs., and is a very good athlete ( a 4.4-second 40-yard time as a corner). He made lots of great plays in college, but needs to develop his game and shake the injury bug. I really like his chances of being a good press man corner in this scheme. DeMarcus Van Dyke fits in the same criteria as Ras-I Dowling. He has lots of potential and athletic ability. He could also easily be a starting corner if he develops his game and learns to be a better tackler. Defensive end Shea McClellin has more athletic ability than Jeremy Mincey and I could see him starting there in the future. McClellin isn’t a liability in defending the run like fellow teammate Bruce Irvin and has the potential to start at left end. Harvey Dahl is 30 years old and may lose his starting job in the near future. He’s the smallest guard on the roster and we’re looking for more bulk and strength at the position. Roderick Hood overachieved in 2011 and I don’t expect his play to continue at a high level for very long. Neil Rackers and Zolton Mesko are only average specialists; competition will be brought in to challenge them in future years. The most difficult part of the process was deciding where I could allow my team to be weak. I initially had a good left tackle, solid outside linebackers, and decent corners, but then I had to fit my team under the $150 million cap after building it for $160. The final difficult decision was at backup QB. I couldn’t afford a veteran to play behind Luck, but also had to let go of Ryan Mallett. With a run based attack and forcing offenses to pass the football, I would prefer an outdoor grass field in a cold part of the country. Snow and wind is preferred for my squad. J’Marcus Webb is a risky selection at left tackle. He has underachieved thus far in his career. With a young quarterback in Andrew Luck, having a shaky left tackle is probably a worst case scenario for not only allowing a sack, but also contributing to potential injuries. Brandon Albert switching to left guard is risky because if he doesn’t play at a high level I wasted a lot of money that could’ve been utilized at the many holes on this team. However, I’m confident his switch to guard will improve his quality of play. Martellus Bennett has underachieved in his young career thus far. He has great size and talent but his work ethic is lacking. Hopefully he will get motivated as the starting tight end on my squad. Roderick Hood and Adam “Pac Man” Jones being the starting corners for my team is very risky. Neither corner is in the prime of his career, nor is either one at the elite playing level a team needs corners to be in the current NFL landscape. Both played very well last season and I’m attempting to squeeze another season or two of quality play out of them. Eric Berry is a phenomenal talent at the safety position, however he’s coming off an ACL injury and he needs to return to form for this defense to thrive. Quarterback Ryan Mallett is another name I expected to see quite a bit in the coming weeks, but Whalen’s point about the salary cap might change that dynamic. Photo by Beth Hart. Jared Gaither played great in 2011 and was reasonably priced in this format, but I couldn’t find a way to add him. 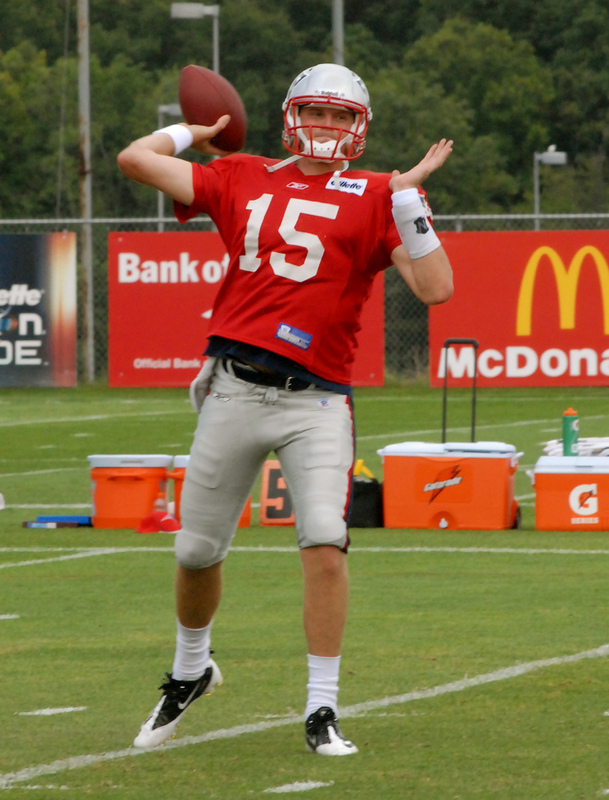 Ryan Mallett is a great talent that would’ve thrived behind a big offensive line with his big-time arm to take shots down the field. Ahmad Brooks is the outside linebacker that I really wanted to add and pair with Patrick Willis; however it just was going to hurt me in too many other areas. Mike Wallace’s speed is needed in this scheme badly to keep defenses from stacking the box and I would’ve paid much more for him. Patrick Willis is the leader of the defense and the price on that is almost invaluable. I think I clash with modern NFL wisdom in that I’m focusing on the run and not the pass. Premium left tackle, quarterback, tight end, and wide receivers are lacking on my team because of scheme and I’m attempting to break the current state of the NFL in running the football. I comprised my team to include as much leadership, winners and starting experience as possible. Very few positions don’t include one older veteran that can help teach the young players the way of the position and how to be a professional football player. Ten of my team starters have won a division title, which will help many of the younger players in big games. Many of my backups have starting experience such as Jason Smith, Rex Hadnot, Chilo Rachel, Peyton Hillis, Dwight Lowery, and Joe Lefeged at multiple positions, which affords me flexibility with the team and potential injuries. Special teams aren’t ignored on this team because I’ve learned how important it can be to winning football games. Important not only in scoring points and preventing other special team units from scoring, but also establishing good field position. Four different players have made the Pro Bowl for special teams that will play on this unit: Brendan Ayanbadejo, Eric Weems, Corey Graham and Montell Owens. These veterans will help shape the young contributors and bring the attitude needed for a great special teams unit. 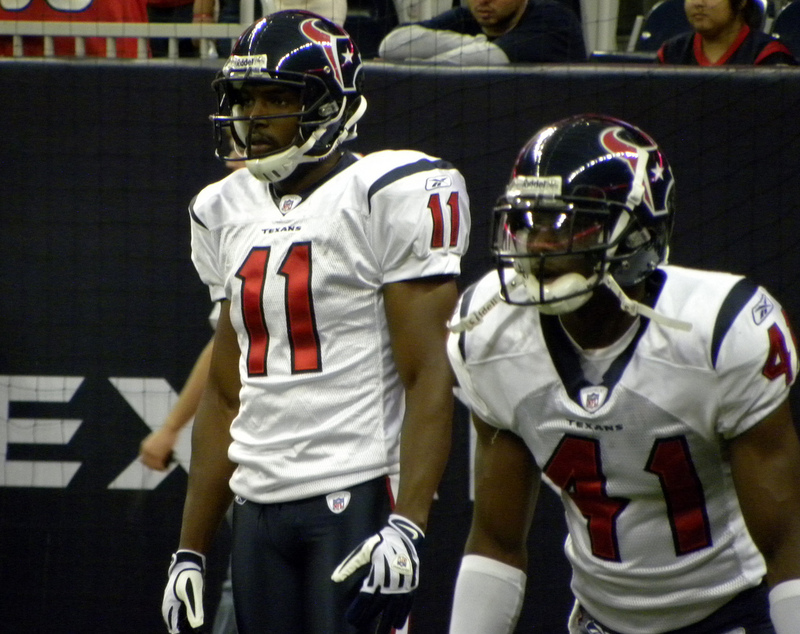 Neil Rackers and Zolton Mesko add two veterans that have kicked in some bigger games as well. Will Marty Ball 2012 do anything to adapt to the current NFL or is he going to use the same stone bludgeon lashed with vines to the wooden handle that he used in 800 BC? Football is football. With the correct coaching and players that fit the scheme, every play should work. When Marty Schottenheimer had multiple good runners and a competent quarterback, his offensive teams have been stellar. Earnest Byner, Kevin Mack and Bernie Kosar led the Browns to multiple deep runs in the playoffs and top-five scoring offenses. Christian Okoye, Barry Word and Steve Deberg finished sixth in scoring. Dave Krieg led the Chiefs to a season seventh in scoring and Joe Montana led them to eightth in scoring. Drew Brees and Ladainian Tomlinson finished third in scoring and Philip Rivers, Tomlinson and Michael Turner finished first in scoring. I’m envisioning Andrew Luck, Jonathan Stewart and Peyton Hillis jumping right in with some of those teams as having some of the top offenses in the NFL. The NFL is moving towards a 60/40 pass-to-run ratio. This team is not built to air it out in that fashion and contrary to what many believe Marty’s teams have generally passed more than they ran. However, I’m envisioning a 50/50 ratio to maybe even more of a split towards running the football. Controlling the clock, wearing out defenses, and gaining yards on every single play. Martellus Bennett and Kyle Rudolph are a large part of not only the running game, but also for play action passes. They provide huge targets and good talent at a position that Andrew Luck felt comfortable throwing to often at Stanford. Three-step, five-step, and seven-step with max protection, play action, and screens will be the passing game. Mike Wallace, Jon Baldwin, Emmanuel Sanders, Golden Tate and Andrew Luck is not a bad passing attack. Our goal on offense for first down is four yards or more. Second down is half the yardage needed or more. Third down to convert the yardage for a first down. I envision: Stewart for four, Hillis for three, Luck pass to Rudolph for five and a first down. Stewart for three, Hillis for four, Stewart for four, and a first down. Very efficient offense. In the end, no I don’t envision anything new or innovative coming from Marty. However, I constructed the team for his scheme to work very well.